Celebrity involvement in presidential politics in 2016 has deviated from tradition in one big way. Donald Trump cruised to the Republican nomination on the strength of his own celebrity status. He parlayed his celebrity status, insult-comic debate skills and Twitter tirades into an estimated $2 billion worth of free media. In contrast, Ronald Reagan, the most successful entertainment celebrity to make the transition to elected office, took a more incremental path to the presidency. Trump has never sought experience in public service or political leadership. Instead, he has primarily relied on reality TV notoriety and media savvy to make the transition directly from celebrity to major party presidential nominee. But my research on celebrities and politics shows that celebrity endorsements of presidential candidates are intended to achieve a number of objectives that Trump may or may not be pulling off on his own. Celebrity endorsements may help energize supporters and help the candidate raise money. They may assist candidates with demographic and political constituencies that have been out of reach. And, of course, candidates hope that celebrities will persuade voters to support them. In past elections, probably the most significant example of a celebrity aiding a candidate in raising money and getting votes was Oprah Winfrey. She supported Barack Obama during his 2008 primary contest with Hillary Clinton. Scholars Graig Garthwaite and Tim Moore estimate that Winfrey’s endorsement generated more than one million votes for Obama. The star-studded fund-raiser she hosted at her mansion in 2007 raised more than $3 million for Obama’s campaign. During the 2016 Democratic primary campaign, Bernie Sanders touted the endorsement of African-American rapper and producer Killer Mike as he tried to woo young African-Americans. Likewise, Hillary Clinton used the endorsements of pop star Demi Lovato and actor Lena Dunham, as well as other young celebrities, to attract millennial women. But how effective have these celebrity endorsements been? The endorsement of one African-American rap artist couldn’t solve Sanders’ disconnect with black voters, especially against a candidate who’s spent years working with the African-American community. And, despite her young celebrity endorsers, many millennial women were skeptical of Clinton’s ability to represent their generation. A-listers have been almost completely absent from the Trump campaign. He garnered early support from actors Scott Baio and Kirstie Alley, rocker Ted Nugent, reality TV star Willie Robertson of “Duck Dynasty” and athletes Richie Incognito, Pete Rose and Mike Tyson. Nugent appeared in a campaign video, and Baio and Robertson spoke at the Republican convention. Yet, no celebrities have been overtly visible in Trump’s post-convention campaign. Trump wanted showbiz pizzazz in his campaign. But celebrities may have weighed the ramifications of publicly aligning with him, and decided to stay away. It appears that some who once backed Trump, such as Kirstie Alley, have reconsidered. For some, not supporting Trump may be a strategic career decision to protect their reputation and future economic viability. In October 2015, my colleague Melissa Miller and I surveyed 804 Ohio general election likely voters. We asked them whether a particular celebrity endorsement would make them “more likely” or “less likely” to support a candidate. Celebrities who have made current or past endorsements, or who have been politically active in other ways, were chosen to be studied. By subtracting the percentage who responded they would be “less likely” to support a celebrity-endorsed candidate from the “more likely” percentage, we are able to calculate a simple measure of the net effect of the endorsement. None of the celebrities showed a net positive effect, and four of them showed double-digit net negative effects. Given that the margin of error is 3.5, differences of seven points or more may be significant. Celebrity endorsements work best when the celebrity is well-known and well-liked by the potential voter. Celebrity endorsements in the 2016 presidential contest appear to be no exception. For instance, country star Trace Adkins, who won Donald Trump’s All-Star Celebrity Apprentice and supported Mitt Romney and John McCain, is a net drag on a presidential candidate of 8.5 percentage points among all likely voters. However, among those who say country music is their favorite, this flips to a net positive of 7.3 points. Adkins has not formally endorsed a candidate in 2016, although publicly he has spoken positively about securing the U.S. southern border, one of Trump’s favorite issues. 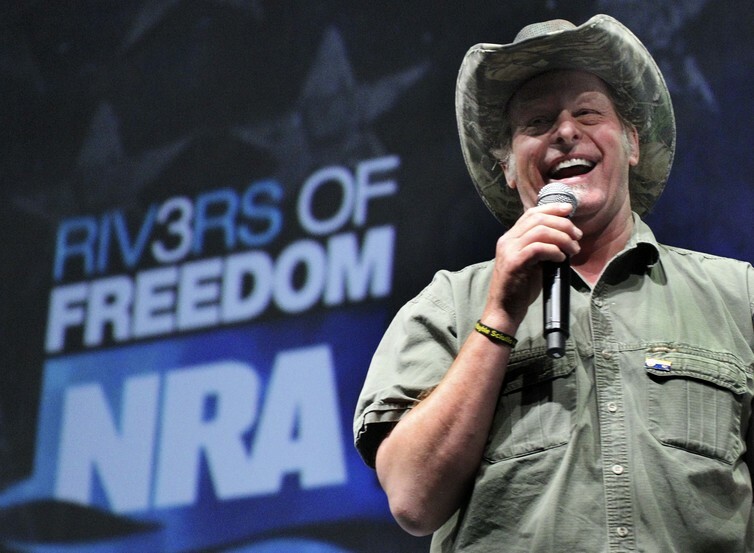 Ted Nugent endorsed Donald Trump in May 2016 and is a 13.4 point drag overall. However, among those sympathetic to the Tea Party, he is a 14.1 point net positive. A Nugent endorsement may hurt Trump with the overall electorate, given the controversial things he has said in the past about President Obama and Hillary Clinton. Recently, Nugent appeared in an eight-minute video for Trump, but it is unclear if the ad ran anywhere except online. Oprah Winfrey endorsed Hillary Clinton in June 2016 and is a 5.2 point drain among voters overall. However, among African-Americans she is a net positive of 20.7 points. Clinton may be well-advised to deploy Winfrey to increase African-American voter turnout in the remaining weeks of the campaign. In the 2016 election cycle, Hillary Clinton has pursued the more traditional path of using celebrities to connect with key constituencies and bring glamour and vitality to her campaign, while Donald Trump has slashed out an entirely new course. We’ll know who was more successful in a few weeks.